AZEK is a composite material used for construction that is noted for its longevity and sturdiness. AZEK is a composite material used for construction that is noted for its longevity and sturdiness. Reliable and easy to maintain, this material is an ideal choice for composite decks, which are often exposed to the harshest elements of nature with little protection. Since decks are also highly valuable additions to houses that are often closely tied to a home’s layout and value, it is important that your deck puts up the best face it can possibly show. For those living in Severn, you have to deal with the colliding weather patterns of Northern and Southern Maryland. Choosing the right deck for this situation is extremely important. AZEK composite decks come with a full load of benefits that can justify your choice over other materials. Its lifespan is far longer than a typical wood deck. AZEK resists damage from most common sources and holds up better in inclement weather. 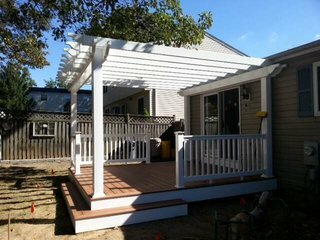 Its ability to keep mold and mildew away means that it will continue to look good years after standard wood decking begins to rot from underneath. AZEK composites also don’t stain easily; while this means that you will need to choose your color beforehand, it also means that wear won’t show over time as grime falls onto your deck and is washed away by the rain. The material also doesn’t split as easily when construction tools are applied, meaning you will get more from each board when you put it together. Since all of these factors mean that maintaining your deck is much easier, you won’t have to worry about rebuilding your deck anytime soon. You don’t need the resources of a lesser material, so those can be put to a different use. Finally, AZEK is certified by the company that makes it for a lifetime, and can be recycled when the decking finally needs to be replaced. An AZEK deck is worth the same as an addition to your home as a wood deck. The composite deck has the benefit of not needing repairs and constant observation, meaning less stress on your wallet and nerves. The material is also weighs 40% less that other composite choices, meaning that the labor of moving the boards takes less effort, along with putting less pressure on the land underneath while your deck is in use. The costs in general are lower, leading to a happier home for all involved. Freedom Fence and Home has lots of experience with AZEK decking, and is available in the Severn area to install custom decks to suit your needs. We’re also very familiar with a broad range of other materials such as wood and PVC. Call Freedom Fence and Home at 443-271-6841 for answers to all questions about AZEK composite decks. We will also happily answer questions about other types of decking. You can also reach us through our website. Follow us on Facebook and Twitter for even more information! This entry was posted on Thursday, April 23rd, 2015	at 12:56 pm	. Both comments and pings are currently closed.